The MCH series drives are designed for the HVAC market and the specific requirements of industrial and commercial installations. 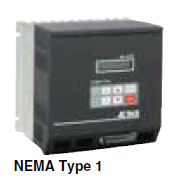 Available in NEMA 1 vented, NEMA 12 oil & dust-tight and NEMA 4 watertight enclosures. The 2-line, 32 character backlit display offers intuitive operator interface using plain English programming and operational information. The MCH drives feature a keypad with H-O-A operation and personal computer interface using AC Tech's Techlink software. A built-in UL-approved thermal overload provides full motor protection. PID setpoint control lets the drive software adjust the motor speed to maintain a preset pressure, flow, temperature or other independent variable. Complete with a two year factory warranty, the MCH drives can be ordered with standard options such as input disconnect and fusing, line reactor, 3-contactor bypass and much more enclosed and mounted to the drive in a ready to install package. The MCH series is available with an optional remote keypad that provides all the functionality of the standard drive mounted keypad and display. A packaged dynamic brake option includes control and resistors in an easy to implement solution for fast stopping or deceleration requirements.